Gold was mined in San Francisquito Canyon throughout the latter half of the 19th Century. This is an 1890s operation on Frank LeBrun's ranch, which was submerged below the reservoir of the St. Francis Dam from 1926 to 1928. This is a typical and complete mining scene of the 1860's - '70s - '80s. The scene was on the corner of Frank LeBrun's homestead in San Francisquito Canyon in the early 1890s. The well was about 25 feet deep in the San Franciscquio Creek. There were two adobe pillars, maybe 18 feet high, 3 feet square, carrying a gallows frame of sorts, of a single timber, maybe 8 x 8, suspending two pulleys -- one into the well, with buckets on each end of the rope, and one into the ground. Sluice boxes are visible, bottoming maybe seven feet above ground level. 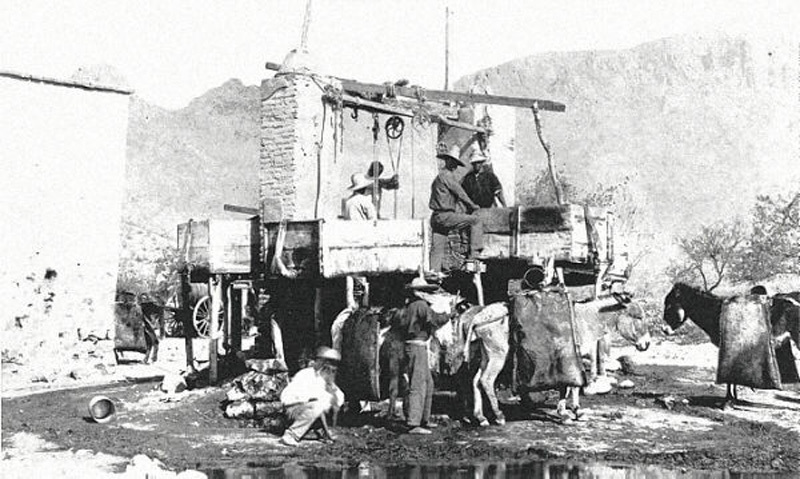 The burros carried counter-balanced ore sacks of maybe 60-pound capacity, which were filled with placer gravel at the "Gold Bowl" near the head of the adjacent Dry Canyon. The ore sacks were pulled up, emptied into the desired sluice box, and sluiced with water pulled up from the well. The boxes were probably riffled and cleaned as desired. A lot of assorted Mexican labor was used in this operation. LeBrun sold to Los Angeles City in 1922, the ranch being later part of the reservoir at St. Francis Dam. A hundred feet of madly rushing water passed over the Raggio ranch when the dam broke in 1928. Nothing below it was left in San Francisquito Canyon.